More info about the thing that was up my nose (pictured above), is here. So, I had my sinus surgery recently. Was in surgery 2 hours, and in the hospital 13 hours. When I got home from the hospital. Blood coming out my nose, as expected. Actually already breathing better. Still recovering 2 weeks later, but it’s a good thing that I did it. May mitigate some life-long breathing problems somewhat. 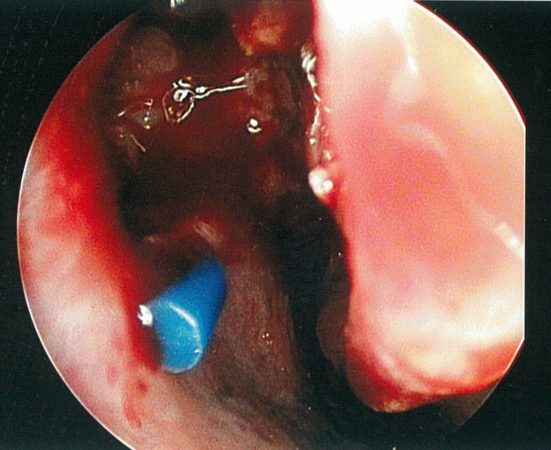 Aside from all the cutting and slicing the doc spent 2 hours up there doing (I was out cold), he found a piece of blue plastic embedded in my sinuses, in an area of the sinuses called the Middle Meatus, which is pretty far back.. The plastic was hard, solid (not hollow), and about a quarter inch long. Doc said it was all the same width. Looks tapered in the pic because medical endoscopes have a bit of a fish-eye lens thing to get more image from a tiny footprint. Also, this may be why, even when my nose is clear and I’m not sick, I sound stuffy. Anyone who’s heard me on radio or knows me knows this about me. And yes, I’ve seen the Simpsons episode where Homer had a crayon removed from his nose and got smarter for a while. lol. The photo above is when the doctor exposed it. It was totally covered before that. The other pic below after he exposed it, but taken from further back. If you look carefully, you can see the end of it sticking out. It’s probably part of a toy. The surgeon threw the item away with the medical waste he pulled outta my head. My older sister reminds me that I put things up my nose as a little kid and had to go to the doctor for it twice. I’m 54. If that happened after age 3 I’d remember it. Has this thing been up there for a half century?? Please don’t put your plastic in my head.